When God Told Abraham to Go, Where Did He Travel? More than 1/3 of the Book of Genesis tells of the life and times of Abram (later named Abraham). We read of his great faith in God and God’s promise to make him the Father of many nations. Abraham listened to God and when He said “Go”, Abraham obeyed, over and over again. Like God Himself, Abraham offered up his son as a sacrifice knowing that God would deliver him from this difficult test of faith. Because of that the writer of Hebrews says “By faith Abraham, when he was tried, offered up Isaac: and he that had received the promises offered up his only begotten son, of whom it was said, That in Isaac shall thy seed be called: accounting that God was able to raise him up, even from the dead; from whence also he received him in a figure” (Hebrews 11:17-19). I am always encouraged when I read about Abraham and his obedience to go. But where did he go? Take a look at what I found in the Bible about the many travels of Abraham and his family. Abram, his wife Sarai and his nephew Lot traveled with his father Terah from the Ur of Chaldees to Haran. Abram’s father died at Haran. 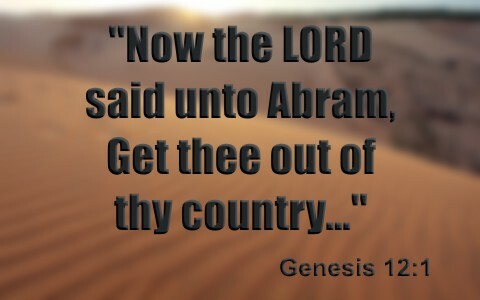 After Terah died Abram listened to the Lord when he told him “get thee out of thy country…”. And so he packed up the family and went to Sichem to live with the Canaanites. In Genesis 12:7 the LORD actually appears to Abram to tell him to take the land. After traveling from Sichem to Bethel Abram called upon the Lord with thanksgiving and offerings. Abram was faithful to continually call upon the Lord for direction. They continued south toward Egypt because there was a famine in the land. It was at this stop that Abram convinced Sarai to lie and tell the Egyptians that she was his sister, rather than his wife. He feared that if they learned she was his wife that they would kill him so they could take his wife. Abram returned to Bethel from Egypt along with the abundance of cattle, silver and gold. Again Abram called unto the Lord for guidance. From there he traveled back to Hebron. During Abram’s trip from Hebron to Holbah near Damascus he is faced with the need to rescue Lot and the women along with many possessions from a band of robbers. When Abram returned to Hebron with his kinfolk and possessions he received praise from Melchizedek the king of Salem, whom was also a priest. Next stop in his travels was Gerar where Isaac was born. In this passage we also read of the exile of Hagar and Ishmael in the desert. Hagar was Sarah’s handmaid that was given to Abraham when Sarah was barren. Abraham is the father of Ishmael and when Isaac was born Ishmael was about 13 years old. Jealousy between Sarah and Hagar caused Abraham to send them into the desert. From Gerar Abraham traveled to Beer-sheba where he made a covenant, as sort of peace treaty, with Abimelech king of Gerar. In this Abimelech was asking Abraham to deal fairly with he and his people and promise not to tell anymore lies, such as he did about his wife. It was the journey from Beer-sheba to Mt. Moriah that God sent Abraham to sacrifice his son Isaac as a test of his faith. God spared Isaac after testing Abraham. And then Abraham returned to Beer-sheba. Abraham went back up to Hebron to purchase a burial place for his wife and then he returned back to Beer-Sheba where he died. He was then carried by Isaac and Ishmael to his final resting place back in Hebron where Sarah was buried. How faithful are you to follow where the Lord leads? Do you ask Him what you should do or where you should go? When He answers, do you go? Previous post: Why Does Jesus Say He Is The Only Way To The Father? Next post: What Does It Mean To Fear The Lord?